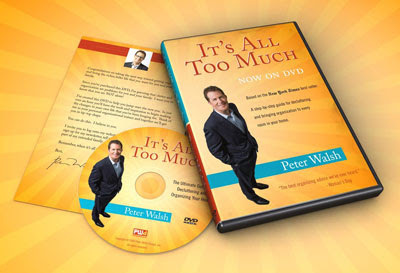 A few years ago, Peter Walsh, organizational guru extraordinaire, published his New York Times Bestselling book, It's All Too Much: An Easy Plan for Living a Richer Life with Less Stuff. For all of us living in a world full of clutter, his organizational books provide the inspiration needed to conquer the piles and the mess. Just recently he released a DVD version titled It's All Too Much. Now I don't plan to ever invite Mr. Walsh to visit my home, and he will never, ever step foot into my basement. I'd be too embarrassed by what he'd find, and I don't think I'd handle the critique very well. I know I have some clutter issues, and, frankly, I find them a tad overwhelming. But what I can handle is watching his shows on TV, reading his books and learning from his helpful tips and advice. This year, I've resolved to put some of the tips to use and bring a little more order to our lives one small step at a time! In this DVD version, Peter Walsh takes the viewer step-by-step, room-by-room, space-by-space. He addresses the typical problem areas and provides simple solutions to reduce the clutter, even in storage areas and cars. He divides clutter into two types: "memory clutter" and "I might need that one day clutter." (I have both types and do have a hard time letting go of items!) According to him, in order to start the declutter process, first an overall vision for the home is necessary. Understanding function, zones and limits is essential as well as stopping the in-flow of stuff. Master bedroom: This is the one room we neglect the most, but according to Peter, it is the one room that requires the most honor and respect. The space should welcome like a retreat. It is important to keep flat surfaces clear, including the floor and bed. Closets: We wear 20% of our clothes 80% of the time. Regularly clear out unworn clothes and organize shoes. Bathroom: Keep like things together / Keep a first aid kit in the bathroom so that in case of an emergency, all needed items are conveniently organized. Office: Use files, clear out paperwork. Create a mail center. Child's Room: Make sure kids can reach their clothes / Organize Kids’ artwork in a large portfolio or frame on the wall. Scan the artwork and compile in a photobook. Teens can learn from Walsh's organizational advice, too. One Brimful Curiosities reader will win a copy of Peter Walsh's organizational book geared toward teens titled It's All Too Much, So Get It Together. To enter, leave a comment with an organizational tip. • Contest ends on Monday, February 1st, 2010 at 11:59 PM CST. I have a lot of both types of clutter I'm afraid. Fortunately, it hasn't been building up long. Mostly I have a lot of books I need to get rid of! What a cool giveaway! We try to de-clutter our home on a regular basis. But that was MUCH easier said than done before we had our daughter. Now it is HER stuff that is everywhere; we just don't have any more storage space for it all! I like it when my house is clean, too! Now, if I could just get the cleaning faery to do her job!! Cleaning Tip: throw the mail out as soon as you take it out of the box. There's nothing worth keeping in there anyway. I stumbled on your blog, but while I'm here I figured I would enter. OK, bonus points: I subscribed in my Google reader, and I'm going to link to your blog in tommorrow's post on my blog Ink Spells. I blog about children's books, targeted to advanced readers ages 8-12. I'm also a writer, so I talk writerly stuff, and pretty much anything else that's cool and relates to the wee ones! Organize your closet by hanging all the same color clothing together. Easier to pick out what you want. I rotate toys for the kids to play with, so that they don't have all their toys out. When I get out toys that have been hidden for awhile, they seem new again. Here's my tip-If you haven't used or worn it in 2 years, it's time to toss it. My tip, start small, if you have a lot of disorder don't try to fix it all at once, you'll wear yourself out halfway through, quit and get disheartened, take it in tiny bites. My organizational tip is to go thru your mail as soon as you get it, especially the ones that are junk. Throw them away immediately! Don't let it pile up. Follower and subscribe to your feed. I'm also a subscriber to your RSS via Google Reader. What a great giveaway.. This is something I really need. My biggest organized tip is to just take it one day at a time.. little by little.. I have a huge project ahead of me and I can only think about it in pieces instead of clearing out the entire garage filled with my mom's things. She passed away and Everything is stored in my garage. LIttle by Little.. One day at a time..
Also I usually use the adage, When in Doubt, Throw it OUt!!! works in the kitchen for sure! My organizational tip is to simplify! Take it one room at a time... throw out useful things, giveaway those things that other people can use, and love/use what you keep. I by no means have it all together, but I've found it's so much easier to keep things organized when 1) I actually know what I own 2) I love what I own 3) ergo, I want to care for and easily find what I need when I need it. :) *Sigh* ... it's still a process for me. I follow via google too. I presort my laundry into lights, whites, and darks (3 separate bins) and when one is full it goes in the laundry. SO easy! I'm the last person to give organizational tips! Though now that I just got an IPod Touch, everything is going to change. Oh yeah - got my task lists on there and everything! My best organizational tip is to take care of the mail as soon as it arrives. Get rid of the junk, put the bills in their place and put magazines into the magazine rack. Don't let anything stack up...take care of it!